What Motivates Chinese President Xi Jinping's Anti-Corruption Drive? : Parallels The push has led to the investigation and punishment of hundreds of thousands of officials — but observers disagree about his intentions. Is the aim to remove rivals or something else? 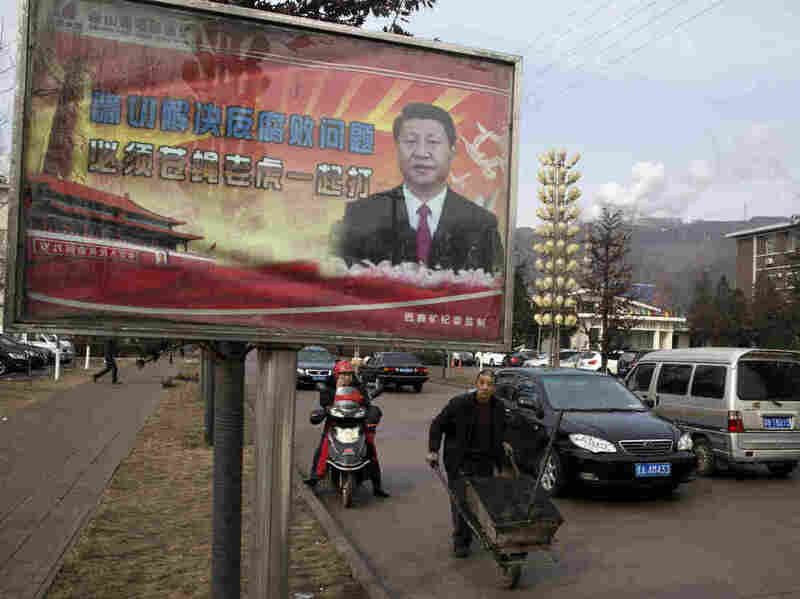 A 2015 billboard in Gujiao in northern China showed President Xi Jinping with the slogan: "To exactly solve the problem of corruption, we must hit both flies and tigers." Hundreds of thousands of Chinese officials have been investigated and punished since Xi began his anti-corruption campaign. In August 2012, Chinese politician Xi Jinping suddenly disappeared for three weeks. China's 18th Party Congress was weeks away, an event where Xi would be anointed as China's next leader. To this day, nobody but key members of China's top leadership knows why. "One story that's popular among the 'chatterati' of Beijing is that there was a lot of concern about the Bo Xilai situation and what it meant for the party," says Arthur Kroeber, managing director of Gavekal Dragonomics. 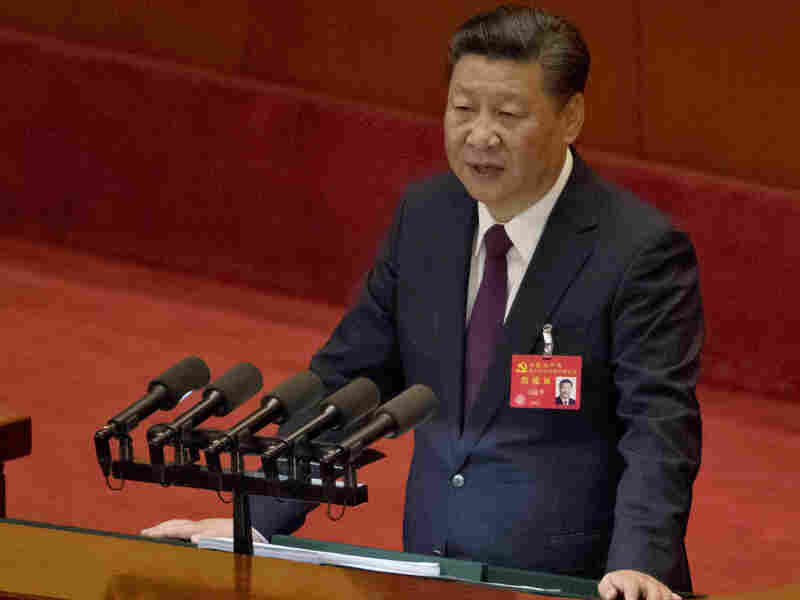 Chinese President Xi Jinping delivers a speech at the opening ceremony of the 19th Party Congress held at the Great Hall of the People in Beijing last week. The year 2012 was a tumultuous one for China's Communist Party. Top politician Bo Xilai was under investigation after his wife was convicted of murdering a foreigner, and corruption within party ranks was spiraling out of control. Kroeber says the rumor behind Xi's disappearance that summer begins with Xi's going to China's Communist Party elders. "And the story goes that he said, 'Look. We've got a serious problem here. This requires very serious measures to rein in corruption and impose more discipline, and I'll do that, but you need to give me carte blanche to do what I want,' " says Kroeber. If party elders weren't prepared to give Xi these powers, the tale goes, then he wasn't interested in the job. This, of course, is a rumor. But if true, it would help explain Xi's rise to become one of the world's strongest leaders. In the months before taking office five years ago, Xi delivered a speech announcing the campaign he would use to consolidate power — a sweeping crusade against corruption, which had become prevalent on every level of society after decades of double-digit growth. According to Willy Wo-Lop Lam, author of Chinese Politics in the Era of Xi Jinping, it was now or never. "There was a good possibility, in fact, that if high-level corruption continues, the people would rise up and overthrow the party," says Lam. To date, Xi's anti-corruption drive has led to the investigation and punishment of hundreds of thousands of government officials. Lam says Xi has used the campaign to eliminate key members of rival factions within China's Communist Party — the Shanghai faction, led by former President Jiang Zemin, and the Youth League faction, led by former President Hu Jintao. "Xi Jinping has been successfully building up his own faction, the Xi Jinping faction, which has now displaced the Shanghai faction and the Youth League faction as the largest faction in the political party," Lam says. At the opening session of the 19th Party Congress last week, Xi announced a new era for China. It was a way of distinguishing his policies from those of his predecessors. Lam believes Xi has become the strongest Chinese leader since Mao Zedong by wielding the anti-corruption campaign as a Machiavellian tool to eliminate potential rivals. "I think the evidence that we have is that that is not his aim," Kroeber says. He points to how far-reaching Xi's campaign has become, permeating every level of government. "His aim is much broader," Kroeber says. "He wants to create a system that will survive after him. And in that sense, he is a kind of member of this Chinese elite that has a sense of mission about the country as whole." In Shanghai, Peter Corne, a managing partner at Dorsey & Whitney who has practiced law in China for more than two decades, agrees. "From my discussions with local people, that's completely changed their view about the country. It's given them hope," he says. He says that if Xi is using the anti-corruption campaign to remove political rivals, then it is only a small part of what has become a far-reaching reform of how China is governed. "The fact that all government officials are so aware of this and so careful now means that it's become the new normality," Corne says. "And it's just changed the way people think and the way people do things. And I think that's going to sustain." Corne says he has for years felt that practicing law in China was promoting an illusion. Now, he says, it's a little more meaningful.